Step onto the terrace for a massage with one of our recommended masseurs or take an afternoon swim in in the 50 foot pool-with-a-view and you will feel like you are in your own private resort. Solisombra is a luxury hide-away in the Wine country available year-round for discerning guests. If you and your group appreciate design,setting and amenities a cut above the standard vacation rental property, you will not be disappointed. The property consists of a contemporary three bedroom, two and one-half bath main house, plus a Craftsman style one bedroom, one bath guest house, on a ridge-top location with spectacular 280-degree views of the vineyards of Sonoma Valley.There are five very private, fenced and gated acres, much of them level or gently sloping with mature oak and olive trees--ideal for relaxing with your family or friends. The large, well-appointed gourmet kitchen has a six-burner Viking range, two convection ovens, a wine refrigerator, and concrete/steel counters. There is formal indoor dining for twelve people, casual outdoor dining for 12+. The spacious master bedroom boasts a separate stereo system, television w/ DVD/VCR, satellite service w/HBO. The master bath has a two-person, Japanese-style soaking tub and a detached slate shower w/ skylight. New in 2008: Hardcourt Tennis court w/ basketball hoop. 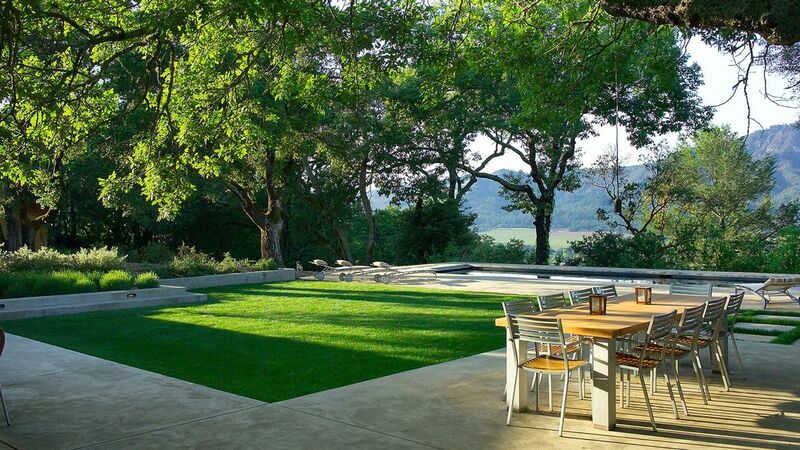 Secluded yet only five minutes from the award-winding wineries of the northern Sonoma Valley. 12 miles from Sonoma Plaza, ten miles to Santa Rosa; 30 minutes to the Russian River and Napa valley. Child friendly. Completely remodeled in 2002. This is not a party house. WE DO NOT ALLOW EVENTS OR PARTIES OF ANY KIND! SORRY!! *Note: On October 9, 2017 Sonoma County was ravaged by several large wildfires. Luckily, though some of the vegetation on our property was burned, the house, the guest house and 99% of our beautiful old oak trees made it through unscathed. We will be closed until October 31, 2017 to repair the landscaping, but we will be accepting rentals again after that. Thank you to everyone for all your support and kind words. From previous experience, we know that nature has a way of recovering quickly from wildfires. It's almost as if the plants were waiting for the moment to show up and shine. We have no doubt that this will happen in the Sonoma Wine Country as well. Secondly, despite what one might think, the huge majority of the wineries and vineyards did not burn-- vineyards are fire resistant due to the wide spacing of the vines and the practice of plowing/weeding in-between the vines. They will re-open almost immediately. Award Wining Interior Designer grew up in Woodside and lives with her family in San Francisco. We looked for 2 years for the perfect home with stunning views, tranquil setting and a great place to gather with family and friends. This property, with its 360 degree views, is magical. It has amazing outdoor space for tennis, swimming and any lawn sport you can think of. Clean, Modern, timeless design, this house was featured in California Homes and Designs in 2009. There isn't a property with more stunning views in the valley. toilet, shower, outdoor shower, Shower can be plugged to bath small children. toilet, combination tub/shower, In the guest house. Spectacular views on three sides. 6 burner Viking Professional gas range. Coffee machine, French Press, individual drip. EVOO, Salt, Pepper, Condiments, rice, flour, spices. Chef's kitchen with all the tools you could possibly want. Hard court. Very private and quiet with beautiful views. Central Heating/Air Conditioning, 1 Stereos, 1 CD Player, Ceiling speakers throughout, High Speed Internet. Our family enjoyed the relaxing atmosphere and beautiful views of this property. We would consider returning sometime in the future. We came up with some rainy weather which made accessing the house and figuring out the in's/out's very frustrating, but after we were settled in and dry everything was amazing! One bummer that I didn't realize is that the 4th bedroom is a cottage off the house. The road to the house is a bit aggressive and if you have a driver coming to pick you up it should be noted. Other than those items we absolutely adored the house. Love the decor, love the openness and the backyard is awesome! Views are the best! We can't wait to go back! Highly recommend to anyone who wants to a comfortable and relaxing place to stay while visiting the area. We can't wait to go back! Stunning home and perfect for a large group. The house had everything we needed for bedding, cooking, etc. The large connected living/dining/kitchen space was ideal for a large group to spend the day relaxing, cooking, and taking in the view. The house is beautifully designed and reflects the style of the area. The vistas surrounding this house can not be overstated...the house looks out onto the Sonoma Valley, framed by old oak trees. Best part may be the giant rope tree swing :) Thanks! What a lovely home in such a lovely place! This warm and inviting home was perfect for a family gathering -- big open great room and well-stocked kitchen, amazing views and plenty of activities for kids and teens too. The house is nicely furnished with comfortable and beautiful linens, well-maintained and clean. The location is central to many wineries and wonderful restaurants, and close enough to grocery stores and shopping too. The hosts could not have been nicer or more accommodating. Thank you Triggs! For the price that we paidper night one should be able to expect a high quality experience. Our experience did not measure up to that standard. This is an interesting house with a wonderful view and with a little work it could be spectacular. However: The house is worn, the beds are uncomfortable, the linens are ordinary, the lighting in the main living areas is very poor, the kitchen appliances are fine but the dishes, pots and pans, cutlery etc are a mishmash of items more suitable for a beach shack than a wine country villa. There’s no pantry space for guest’s groceries. There’s no TV in the living area, just a small TV in the master. Rental guests don’t really want to be surrounded by personal mementoes and photos - it’s a rental house. With a little care and attention and a small cash outlay this house could be very nice. We ended up only spending one night and moving to another home which was much more comfortable and $250 per night cheaper. Thank you for your response. You have every right to post your opinion and we welcome the opportunity to improve our property. Most of our reviews are 5 stars, as you can see, but that doesn't mean that there is no room for improvement. We take great pride in presenting a beautifully designed, decorated and maintained home and strive to live up to our renters expectations. I like your suggestion to add a 2nd television in the main house. The TV in the master bedroom is 40", so it is not exactly small, but I do think guests would appreciate another, larger television in the great room. We will purchase and install one in the next couple of weeks. Your other comments, however, are a bit perplexing. The mattress you slept on in the master bedroom is a McCroskey. It is of extremely high quality and quite expensive (reputedly the Queen of England sleeps on one), the linens were replaced within the last two months and are of a high thread count and we have three sets of ceramic dishes for twelve people (each) in the console behind the living room sofa that you must have missed. Many of your complaints could have been resolved with a simple phone call (e.g. the overhead fans in the living room have lights imbedded in them to add extra illumination, which some people are not aware of). We encourage future renters to call us with the slightest issue so that we can help them have the best and most relaxing stay possible. That is our highest priority and we enjoy the interactions and the ability to help our guests get settled and feel comfortable in what we feel is one of the best vacation rentals in the Sonoma Valley. We had our family to California for the first time, and wanted to show them what Northern California had to offer. This house did not disappoint. My husband and I love to cook and were doubtful that the kitchen would have everything we would need. Boy were we wrong! The kitchen was a perfect...stocked with everything you can imagine. The house slept everyone comfortably, and was beautifully furnished. Truly the best part of this property though is the view. It's remarkable especially with the autumn colors on the vines. We'd recommend this property to anyone looking for a secluded retreat in beautiful Sonoma county.